Came the feeling that enveloped me when I heard the rain drops falling on my window this morning. The crisp morning makes my heart mimic the rhythm and the sound articulated by the staccato of the falling rain. How else can you not love a morning like this. I'm leaving in five minutes, my husband declares. Oops, I might have slept longer than usual, I mumbled. It must have been the weather, as this is sleep-in weather. There are days when you wake up inspired... and today is definitely one of those days. And so as I was about to pour my granola cereal into a bowl of milk, I stopped. Today I'm making a breakfast plate for myself. I declared. I took the longanisa patties in the freezer and started cooking. The sizzling sound and the aroma brought by the patties, added a beautiful note to my inspired Monday morning spread. Happy Monday! 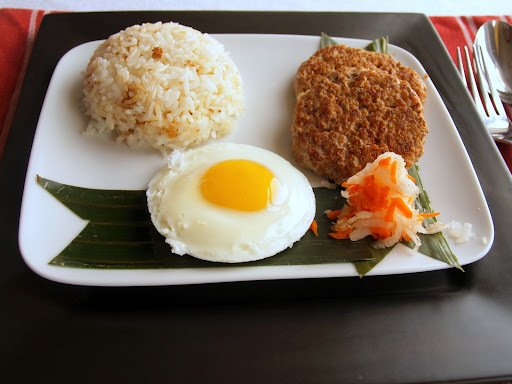 Longanisa is a quintessential Filipino breakfast. It usually comes in sausage form. When I posted my longanisa recipe a few months ago, one of the questions asked was where to buy the casing. You could buy the casing online or in specialty markets and butcher shops. But if you want longanisa in a hurry, try to make it without the casing by making a patty. Mix all the ingredients together. Do not over mix, so be gentle with the pork. Also another tip for an authentic longanisa is that the pork should contain fat and should be coarse in texture. Using a lid of a jar (about half an inch and lined with plastic wrap) I then filled the lid with the pork mixture. Press and flip the lid to remove the patty. This will give you a nice looking patty. Repeat procedure, until you have used all the pork mixture. The patties must be firm enough to pan fry. If it's not firm, put it in the freezer or fridge until it holds well. It took me about 30 minutes. Pan fry each side for about 3 to 5 minutes or until it turns golden brown. 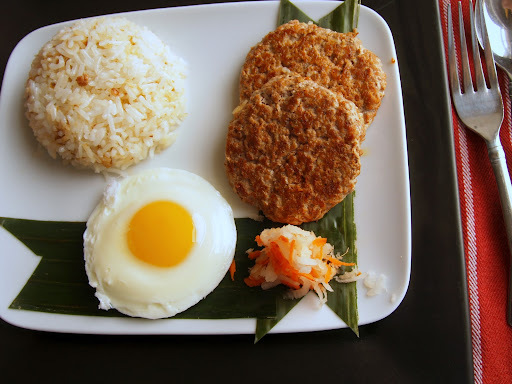 Serve with garlic rice, sliced tomatoes and a sunny side up egg. 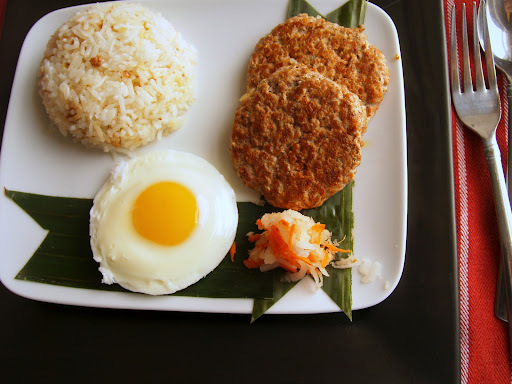 Adding atchara or sweet pickled papaya will definitely provide more kick to this breakfast. In a wok, add cooking oil and garlic at the same time. This way the cooking oil will slowly heat up and the garlic starts to brown, this way you won't burn the garlic. Add rice. Mix well and then season it with salt. Again, do not use sticky/very moist rice. It should be dry and it's best to use the refrigerated left-over rice from the previous day. naku, glad you have that much energy to cook for yourself!!!! I usually just end up with coffee if I'm home alone - but then again, I can't recall the last time I was home alone! Hope you left some for Papa C!!!! WHen you are home alone, you must find things to inspire you to get things done for yourself :). You will know what I mean when you get there. Take care. I hope you had a great start. I would like to have this for dinner too haha so that makes the two of us. :) I hope all's well. Happy Monday! I think I overdid it this morning and poor hubs had to leave without this breakfast plate Oopsies! Yummy! Can't wait to try this. I'm just as inspired by your inspiration. Thanks for sharing this longaniza recipe, Malou! hello Betty Ann! Always great to see you and to read your kind words. Haha it's no secret as I've shared my cooking style before.. . I use the microwave. Cook it for 1 and 10 seconds adjust the power level to 5. The time may vary though depending on how big the egg is and how powerful the microwave is. I hope youll make a perfect egg soon. My husband's favorite breakfast :) I'm pretty sure I could feed him this every morning and I wouldn't hear any complaints. I still haven't had a chance to make your longanisa recipe but now I hope to be able to since I'm done with school. Hi, I used ice candy plastic or 1 1/2 x 10 size for my longanisa casing if hog casing is not available in the market.